Repurposed interior design ideas – Are You Really Eco Conscious? Repurposed Interior Design – Are You Eco Conscious? My eco consciousness with home decorating magazines goes as far as passing them along to friends, but only after I have cannibalized the best pages for my idea file. It has occurred to me that the remainder of these lovely glossy pages will eventually end up in a landfill. But when I read the Treehugger article about this repurposed table, I was relieved to know that someone else was taking responsibility for the huge paper waste that I contribute to. 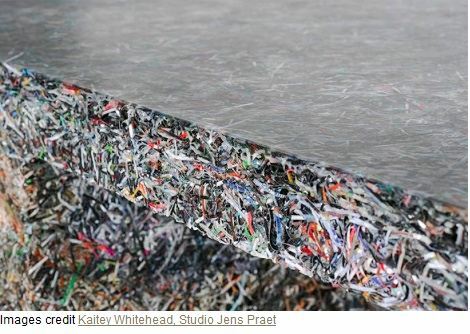 Studio Jens Praet has created the Shredded Collection ’11 which is manufactured with shredded paper confetti and resin. 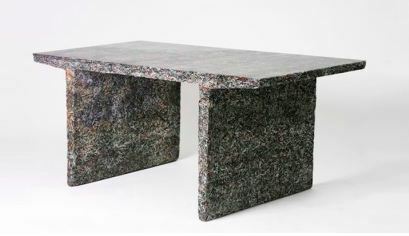 This table was made from 26 kilograms or about 57 lbs. of Fast Company magazine leftovers. Eco-consciousness in my business, Just For looks Custom Drapery, is founded on efficient use of materials in drapery and upholstery design with a secondary fabrication of remnants into decorative throw pillows… hence PillowThrowDecor. I donate my unusable scraps to quilting guilds and teaching groups so I can smugly report that I have almost 0% waste. I’ve lived quite happily in my “Eco Green LaLa Land” until I read a really conscious pricking article “SHED and the Meaning of Sustainable Design” by interior designer Cynthia Mason of The Exuberant Home. Cynthia succinctly highlighted the viewpoints of 4 top-level thinkers and doers of sustainable design. As a sub-trade of the interior design industry, my most profound message from this was ” our job is to educate clients about sus­tain­able choices and one by one, ini­ti­ate change”. Gulp. And…. we should adopt a philosophy whereby… “dis­pos­able becomes an unfash­ion­able and ulti­mately unthink­able con­cept”. Gasp! It’s just not good enough anymore to promote buying “green” stuff. This great “green” stuff was turquoise last year and honeysuckle this year. I’m pointing a finger at my self first, because in selling a client on new draperies, I create a design obsolescence by sensationalizing trends and “the color of the year”. Draperies are almost always replaced long before they are functionally obsolete. Good interior design should last for years however many of us (me included) are easily influenced by the wave of ripping, tearing and redecorating that’s become a leading recreational activity. Encouraging our renovation clients to incorporate green products into their projects is getting it only half right. The other half is disposing of the renovation ‘rubbish’ in an ecologically responsible way by passing materials on to be used as is, or for remanufacture, into something useful. I can always find a new home for old drapes but what do I do with flat foam sofa cushions? Any suggestions? Here’s a must read article by interior designer Michelle Wiebe, “Reclaimed Wood in Your Interiors“. She lists excellent examples of companies and their products that incorporate repurposed wood into new design elements. Michelle asks us, “Who would have thought that old barns, farm houses, and gymnasium seating could find a new use in your home? …Being green isn’t only saving the Earth’s resources, but it’s beautifying your home at the same time.” She also suggests, “Ask your interior design professional about kitchen options for countertops, cabinets and gorgeous shelving alternatives”. What are some of our sustainable choices? How can we, as indi­vid­u­als, initiate change? I’m hoping that they might adopt these questions, as a Blogoff or an #interiordesignchat on Twitter, to identify and promote repurposed interior design ideas and help further development of sustainable choices. In the meantime, my mission will be to educate myself and hopefully you my readership, by regularly sharing “Repurposed Design” information. Please give some thought to leaving a comment below about any repurposed products, ideas or websites that source sustainable interior design products AND ESPECIALLY green products remanufactured from construction /renovation waste. Any ideas? 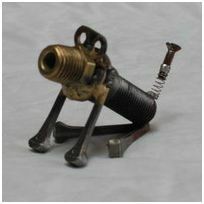 Canine creation from upcycled plumbing bits. Christine – great article! Seriously, you are doing amazingly to have virtually zero waste in your workroom. Give yourself major props for that! One green source is CounterEvolution in Brooklyn – they turn old bowling alley wood into fab furniture. There are many others across the industry who are doing what they can – initiate change one manufacturer and one buyer at a time. Ha… the bad part of almost zero waste means that I save every scrap with a “I can make something out of thist”. I even made braided dog chews out of salvage edges… now that was dumb… we don’t have a dog. I think I will build a list of Green Sources on my site… and you are very right… one at a time. Thanks for stopping by Cynthia! Great article, Christine! It makes us much more thoughtful about the process of design. When I saw the picture of the canine creation, it reminded me of a lamp I had made out of an old, iron sprinkler that had belonged to a client’s father. Believe it or not, it was quite chic and now she has something, with function, as well as a great momento. 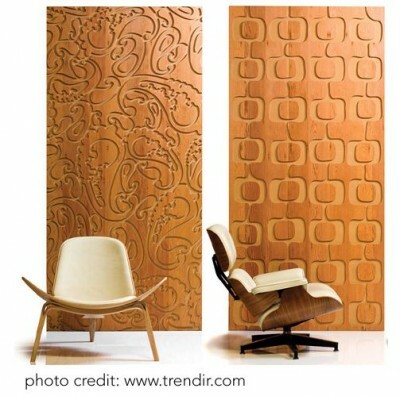 Love the wood panels, too! Great post!! Thanks for featuring Studio M and Michelle on the blog. Lov that you like the eco friendly interiors! Let’s spread the word:) Have a great weekend.. Thanks so much for your kind words Eric! I’ll be back to check out more information at Studio M’s blog.. looks like you have a LOT of interesting and very useful information there! I’m with you here… Let’s spread the word on repurposed design!